Fruit, vegetables, bread, coffee grounds, tea bags, dead plants/leaves, egg shells, uncoated paper (newspaper, coffee filters and other unbleached paper products) and vacuum cleaner dust. Citrus fruits, onions, garlic, leeks or shallots, meat, fish or poultry, eggs, dairy, greasy food, salty food, prepackaged/processed food and glossy magazine paper or coated paper. Will my bin smell or attract fruit flies? How many worms will I need? These questions and more are answered by City Farmer. 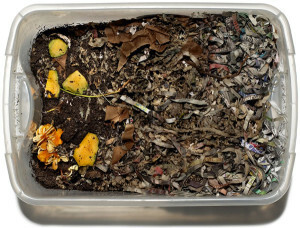 Planet Natural also provides a great worm composting write-up for beginners. Curl up with the Amazon best seller Worms Eat My Garbage: How to Set Up and Maintain a Worm Composting System, a great introductory guide to vermicomposting.